Coverage: Live on BBC Two and online from 27-30 October (19:00 GMT), BBC One on 31 October (13:30) and BBC Two on 1 November (13:30). 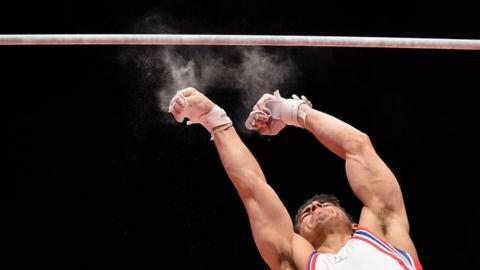 A mistake on the penultimate apparatus cost Briton Max Whitlock a potential all-around medal at the World Gymnastics Championships in Glasgow. The 22-year-old was in silver spot but fell at the start of the high bar routine, as he eventually finished fifth with a score of 89.249. Japan's Kohei Uchimura won his sixth straight all-around title with 92.332 ahead of Cuba's Manrique Larduet. China's Deng Shudi was third and Briton Dan Purvis finished seventh. "He just had a little too much adrenalin. He was an inch off catching the bar. He did really well to get back up and finish his routine." Whitlock scored 16.1 on the pommel to lead after the first rotation, before Uchimura took control in the competition, particularly impressing on the parallel bars with a score of 15.8333. The Briton then dropped down to third, behind USA's Donnell Whittenburg, but an impressive bars routine saw him move back up to silver position which he held on to until the high bar. Despite the early error, Whitlock managed to complete the routine. "Mental strength is really important," Whitlock said. "You have to forget if you muck up. You have to get on with the job. I hope I do the same job tomorrow as I did on the pommel tonight." The double Olympic medallist, who helped Britain's men win team silver earlier this week, competes in the pommel event on Saturday, while Purvis takes part in the floor competition.